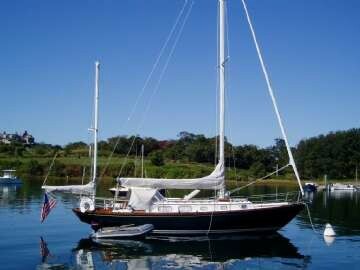 Price reduced on DANCER a 40' Bristol Yawl 1981. She is located in Mattapoisett, MA. Now asking $79,000. She is beautifully maintained Bristol 40 Yawl. Exceptional example of the classic cruising yawl. Split rig makes for easy handling in stiff breezes and Buzzards Bay chop. Awlgripped dark green in 2011. Stainless steel sinks and a higher splashguard forward of the sinks. This makes a much more spacious, practical galley than many of her sisterships. If you are in the market for a classic boat with comfortable sailing characteristics, “DANCER” is worth your consideration. Contact John Osetek for details (401) 465-8634.